Throughout our preparation for The National Stationery Show, we've tried to be as resourceful as possible. Our thinking is 'one less dollar we spend is one less dollar we have to make.' Given the fact that 'Resourcefulness' is Edgar's middle name, he's made the best of it. 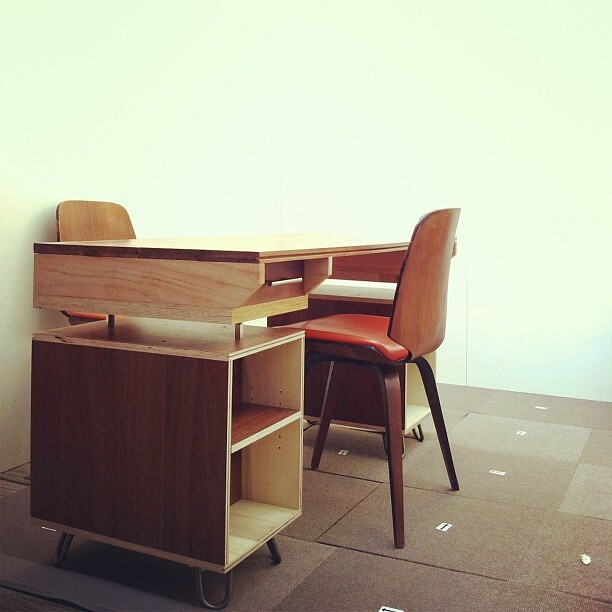 Among the ways this has manifested itself is through the design and construction of a desk for our booth. Patterned after the desk Edgar made me a couple of years back for the studio, this mini-version is composed entirely out of scraps Edgar had in the shop, including teak floor planks for the desk top and plywood floor tiles for the drawers and storage boxes. The only thing we purchased especially for the design were the small hairpin legs.